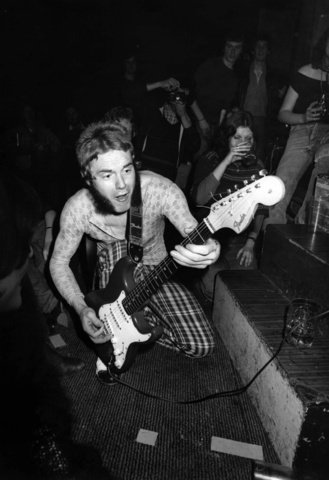 This new Punk 45 album is a collection of tracks of twisted, raw and energized proto-punk music from the early 1970s, ahead-of-its-time music which led the way for the birth of punk in the second-half of the 1970s. 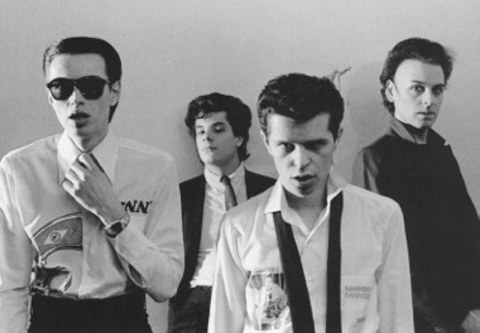 This new album is compiled and has extensive sleeve-notes by Jon Savage. 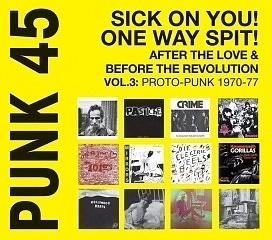 Punk 45: Sick on You! One Way Spit! After the Love & Before the Revolution: Proto-Punk 1969-77 is the third volume in this series, following on from the two earlier albums as well as the massive 400-page Punk 45s cover art book published last year. While the first in the series, Punk 45: Kill The Hippies! Kill Yourself!, focused on the rise of underground punk in America, and the second album, Punk 45: There is No Such Thing as Society did the same for punk and post-punk in Britain, this album draws upon some of the stripped-down hard garage and post-glam sounds of mainly obscure bands that existed in the early 1970s - that were to prove the template for the forthcoming punk movement. This is a unique and fascinating collection of proto-punk tracks from across the USA - Cleveland’s Electric Eels, San Francisco’s Crime, Los Angeles’ Zolar X, Baltimore’s George Brigman and more – as well as from the UK – with Joe Strummer’s pre-Clash 101ers, the speed- induced r’n’b of the Count Bishops and others also included. As usual the album comes complete with text, biographies on each of the bands, exclusive photos and original record artwork.